Eco Valley Resort possesses a research area for landscape design which is located in lake Dong Chanh vicinity, Nhuan Trach, Luong Son, Hoa Binh province. The project scale, according to 1169/QD-UBND approvement of People Community of Hoa Binh was 62.225 ha. The actual scale after adjustment was 60.62 ha. The project area covers a whole hill of over 60 ha, sight view down to romantic Dong Chanh lake which is 80 ha large and cool weather all times in a year. 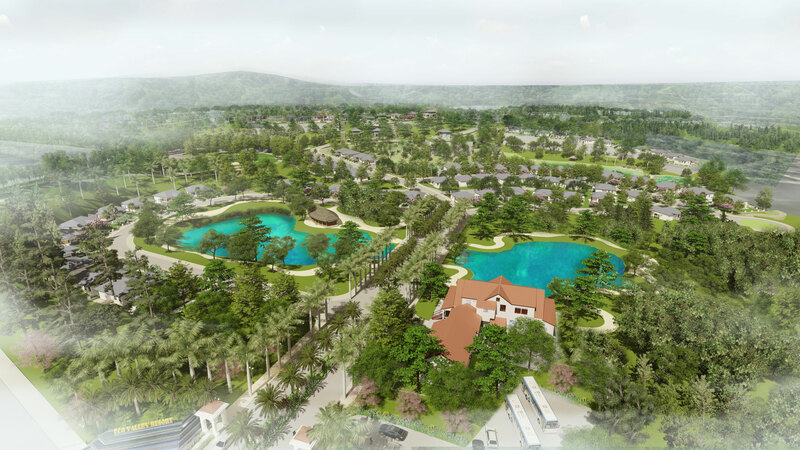 Aim to create an international standard resort at the west entrance to Ha Noi, Eco Valley Resort landscape was designed to be an ecology resort by Eden Landscape. All the landscape was planned and divided into 9 functional areas: sport yard, botanical garden, fishing lake, flower garden 01, flower garden 02, flower garden 03, happy farm area, event holding area and royal palace garden. 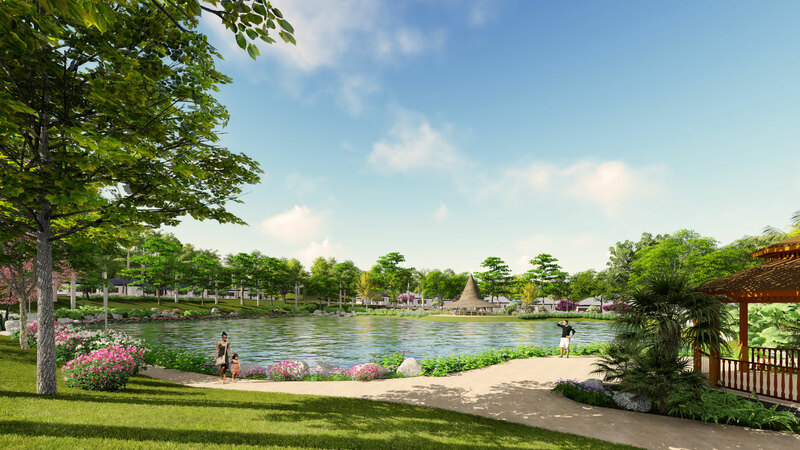 In phase 1, Eden Landscape designed 4 areas which are royal palace garden, sport yard, botanical garden and fishing lake. 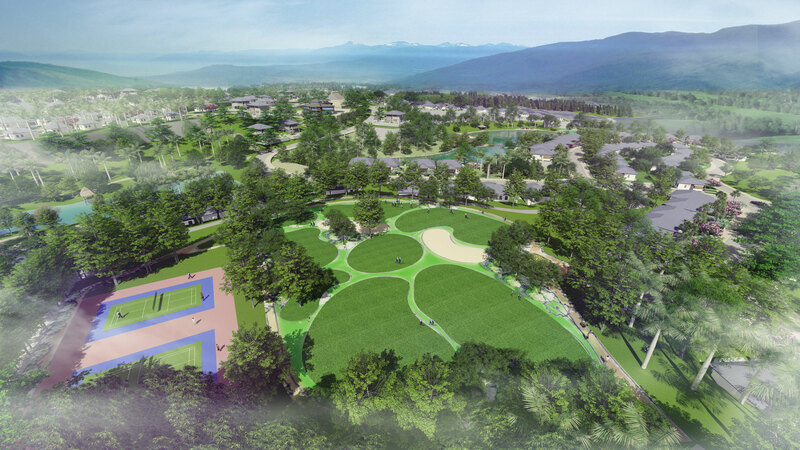 These are landscape areas at the front of the project, serving demands for resting, relax, entertainment combine with study natural experiences for all the residents. With a point of elevating natural elements, Eden Landscape utilized natural elements from terrain, materials to local plants inside design area. Hilly terrain was used and improved to provide lakes, walkways, landscape hills, sight-seeing lodge,… Landscape lakes and fishing lakes were constructed by groundwater streams, therefore providing with fresh and cool water all the time. This helps preserve the environment in the surroundings and ideally contribute to human living environment. Eden Landscape prioritized ecology in landscape designs, especially in an ecology resort, environment protection is always first. Not only preserving local environmental values, but Eden Landscape also conducted researches for least affected solutions to the environment and implemented those into designs. Especially, materials used were mostly local Hoa Binh blue stone, in combination with environment friendly materials such as adobe bricks, mold concretes for damps, walkways. Along with a system of green plants which was carefully chosen to create a closed habitat that would be able to support each others. Plant species were local and some from neighborhoods which also had ability to quickly adapt weathers, soils in the project area. Four sections were designed at phase 1 containing different functions to provide comfort, landscape utilities of a luxury ecology resort. The royal palace garden which is the entrance of the project was designed like a green tropical garden, a charm to everyone coming to Eco Valley Resort. First, you would be amazed by impressive design with natural curves of landscape hills and artistic waterfall right at the entrance. Eden Landscape designed trees system in a tropical way, combination with many layers of palms and shrubs which created magnificent green natural. The main idea for the royal palace garden was a colorful welcome with the main trees of forest apricots with some kinds of shade trees with beautiful flowers, fresh colors like cassia fistula L., yellow tabebuia, tabebuia rosea … Many kinds of shrubs were selected for durability, easy to care, moderate price but still high artistic decoration. The golf course bore within it the idea of a colorful entertainment resort. Shade providing trees like forest Prunus persica, yellow tabebuia, tabebuia rosea. Carpets were selected for durability, easy to care, moderate price and still high artistic decoration. Open space with green grass carpet, smooth lines and soft grace were the special highlight of the golf course. At the fishing lake, architects created a quiet space with rustic countryside and local shady trees to easily exploit the local as fig, coconut. Fruit trees were also used in the area such as grapefruit, orange, mango … With such a relaxed space so shrubs, carpets, ornamental plants were also soft, durable asyellow helmet orchids, hibiscus, rose myrtle, blue tongue. The botanical garden was a highly educated space where people can experience a botanical garden with a diverse population of trees. Topics include: forest trees, fruit trees, indigenous trees, precious trees, pine trees, coconut trees, bamboos, … and many shrubs and mats were colorful. 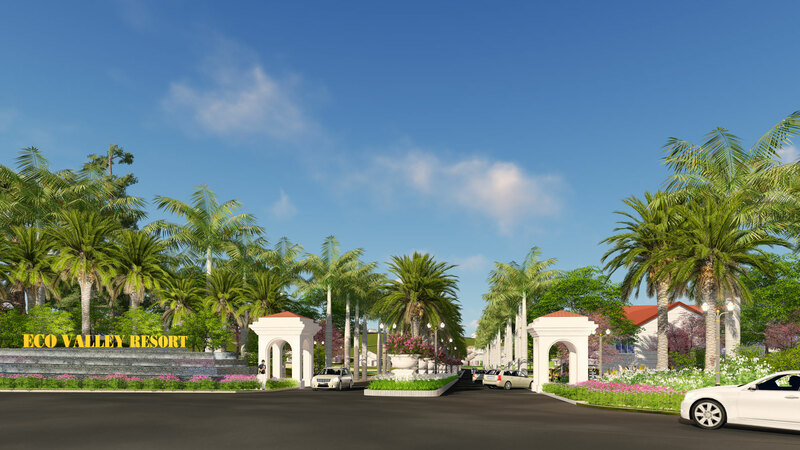 End of phase one, Eden Landscape continued to develop phase two, providing estate market a luxury residential resort. Moreover, to bring future home owners at Eco Valley Resort ideal relaxing life – Harmony between nature and modern time.